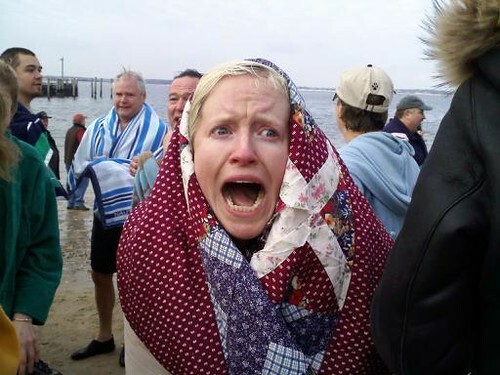 Editor's note: Jenny has bravely participated in the Monument Beach Polar Bear Plunge two years in a row! Way to go, Jenny! There's still time to join our winter ocean plunge team for the one at Revere Beach this Saturday! Sign up now!! So there I was at Phinney's Harbor on a snowy beach with a crowd of locals for the 13th Annual Monument Beach Polar Bear Plunge. According to the guy on the bullhorn, the air temp was 34° and the water temp was 30°. I made sure to take a deep breath and just absorb the moment. I let go of the fact that my Flip camera batteries had just died and I was trusting my sister to work an unfamiliar cameraphone from behind the rope. I was there and I was living this and that was enough. Then, before I knew it: 5...4...3...2..1...and I just ran. I did not have time to think about how nuts this was. When my feet hit the water, I heard a WOOOOOOOO sound and realized it was coming from my own mouth. At about knee-deep, I turned around and fell backwards for a good dunk. I didn't even register the cold because I immediately got right back up and started running towards the shore, where a big, dry quilt was waiting for me. It was then that I started yelling. Because, well, IT WAS F@%$ING COLD AND WHAT I JUST DID WAS SERIOUSLY F@%$ING STUPID. But then I started laughing, and I haven't been able to stop grinning since. I'm so grateful that my sister, Abby, and stepmum, Kathie (a three-time veteran of this particular event), met me there with a large blanket and words of encouragement. My sister's boyfriend made for a handy clothes-hanger. Hi, nice to meet you. Hold my pants. I cannot think of a more perfect way to start my year.